A former state wildlife biologist contends Wisconsin’s high wolf numbers may not be the driving factor behind a record 40 hunting dogs killed by wolves during the bear season that ended Oct. 11. Timber Wolf Alliance Coordinator Adrian Wydeven, a former wildlife biologist for the Wisconsin Department of Natural Resources, said the state saw fewer dogs killed by wolves the last time Wisconsin’s wolf population was this high. 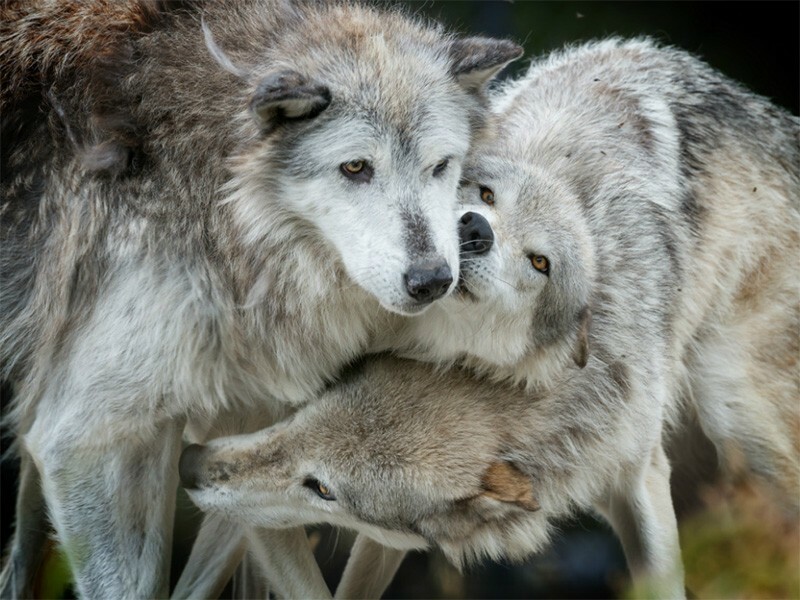 “The previous high count of 815 (wolves) in 2012 had only seven dogs killed that year, and that was the lowest wolf depredation on dogs in about 10 years,” Wydeven said. The number of wolves in Wisconsin grew about 16 percent this year with a minimum estimate of 867. Dave MacFarland, the state’s large carnivore specialist, said a number of things could have played a role in the number of dogs killed this bear-hunting season. Wydeven said a possible increase in hunting activities due to permitting changes last year may also be driving a rise in conflicts. Last year, lawmakers eliminated Class B bear licenses for those who wanted to assist hunters with setting baits or training. “If we’re allowing much more open policy, allowing a lot more people to participate in that activity, that could account for the increases of hound depredations in Wisconsin,” Wydeven said. But MacFarland said it’s not known what impact the permitting change may have had on hunter activity this year. Wildlife officials have said wolves may also be more protective of their pups during bear season and the training of hunting dogs beforehand. Research also suggests the length of Wisconsin’s bear baiting season may play a role in higher numbers of attacks on hunting dogs than neighboring states. Bear hunters can set baits as early as mid-April in Wisconsin, whereas states such as Michigan don’t allow baiting until two weeks before the beginning of the season. Wydeven said the longer baits are used, the more likely they’ll attract wolves. “When hunters release their dogs at the bear baits to go chase bears, there’s a chance if wolves have recently visited the site, they could be sending their dogs after wolves,” Wydeven said. Joseph Bump, an associate professor with Michigan Technological University, was lead author of a 2013 study that found hunting dogs were up to seven times more likely to be killed by wolves in Wisconsin than in Michigan’s Upper Peninsula. “If stakeholders are sincerely interested in decreasing wolves killing hunting dogs, then there’s good wildlife science to suggest that both the timing and length of the bear baiting season is a factor that should be on the table for discussion and potential adjustment,” Bump said. Bump is continuing research in Michigan on how frequently species other than bears visit bait sites. He expects those findings will become available next year. Bear hunters in Minnesota are not allowed to use dogs while hunting. I have accompanied Rod Coronado’s Wolf Patrol on numerous occasion and never once saw them harass hunters. As a matter of fact, Coronado was approached by a lost hound hunting dog this summer while monitoring bear bait sites in Northern Wisconsin on public lands and may have saved the dog’s life. The old hound was lucky that Wolf Patrol was there to rescue him, as 15 bear hounds had been killed by wolves defending their territory in the summer of 2015. Wolves are forced to defend their pups against packs of free ranging bear hunting hound dogs in Wisconsin’s north woods. I will remind readers that bear hound hunters are handsomely rewarded with tax payer’s money of $2,500.00 for each dog killed by a wolf during bear hunting season. Read more about this in an article written by Bill Lueders of Wisconsin Center for Investigative Journalism Jan 5, 2014 State pays scofflaws for dogs killed by wolves while hunting other animals. Wolf Patrol has been monitoring hound hunters in Wisconsin now for over a year. I was first approached by Rod Coronado in July of 2014 with the idea of helping out Wolves of Douglas County Wisconsin’s efforts to ban the use of dogs in the wolf hunt. It appears that state representative Adam Jarchow is pandering to a minority of hunters by introducing legislation that would prohibit monitoring of fringe hunters by citizens, such as Wolf Patrol and Wolves of Douglas County Wisconsin. Does 2015 SENATE BILL 338 proposed legislation prohibit freedom of speech, your First Amendment rights? Just how does this proposed legislation affect journalists, or others using public lands, for example, bird or deer hunters? Is the intent of this proposed legislation to limit public’s right to know if there is any illegal activities happening on public lands? Wolves as of December 2014 are a federally protected species and Wolf Patrol is monitoring the controversial legal practice of bear baiting and bear hunting with dogs in northern Wisconsin. To learn About Wolf Patrol. This legislation, 2015 SENATE BILL 338, Introduced by Senators Moulton, Gudex, Harsdorf, Olsen and Kapenga, cosponsored by Representatives Jarchow, Allen, Ballweg, Born, Czaja, Edming, Gannon, Horlacher, Hutton, Jagler, Kleefisch, Knodl, Kremer, Kulp, T. Larson, Murphy, Mursau, A. Ott, Petryk, Quinn, Tittl and Sinicki. Referred to Committee on Sporting Heritage, Mining, and Forestry. Wisconsin residents If you want to voice your opposition of this proposed legislation contact the above Wisconsin senators. Click HERE to contact WI senators. Attend the public hearing to voice your opposition. This proposed legislation is up for public hearing by Committee on Natural Resources and Sporting Heritage Wednesday, October 28, 201 5 9:01 AM 417 North (GAR Hall), Assembly Bill 433 Relating to: interfering with hunting, fishing, and trapping and providing criminal penalties. Support your right to use public land by getting involved.